Hello friends and fiends. It was a busy and eventful October here at Urban Adventure League HQ, with its shares of ups and downs. And November promises to be even busier, and hopefully with more highs and lows. What's happening round these parts? In the short run, I'm working a lot more than I'm used to (part of this due to covering a bunch of shifts due to a co-worker's sudden resignation). This is good for the piggy bank, but because this month is so full of things I need/want to get done, it means less time for "the other things". Oh well. Speaking of work, we just went on a retreat out to the Oregon Coast over the weekend. This was my only trip to the actual Pacific Ocean this year, and it was a bit weird to do it not on a bike, but whatever. We visited the town of Newport and stayed in a yurt at South Beach State Park. 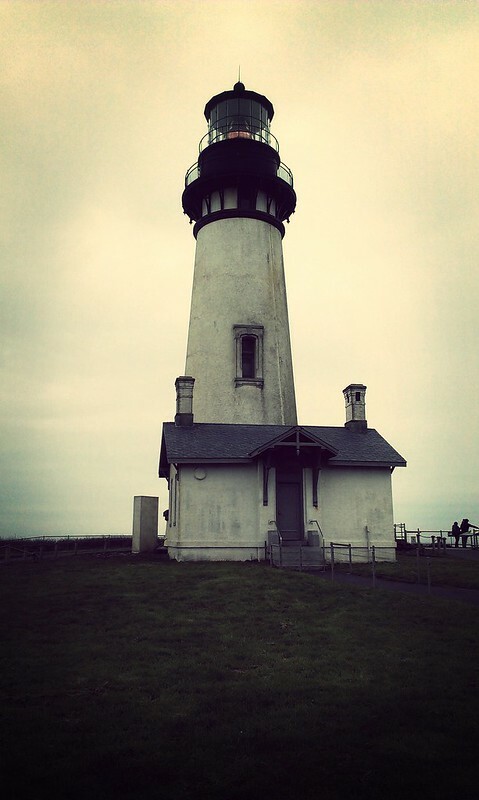 The highlight was visiting the Yaquina Head lighthouse. More photos of the retreat are over here. Not too much regarding bicycle adventures for the near future. The weather is turning and I don't feel the desire to camp. I do want to go on some good bike rides, but I haven't had the time. I will soon, though. Hope all is well with all you fine folk! *If you live in a country that is not the US, you just don't even know. Good for you, sounds like you are moving forward, getting the new adventures moving in the right direction. All the best. Ouch, I've had the shingles before and that was one of the most painful things I've ever had. Nice to hear you are doing well though!